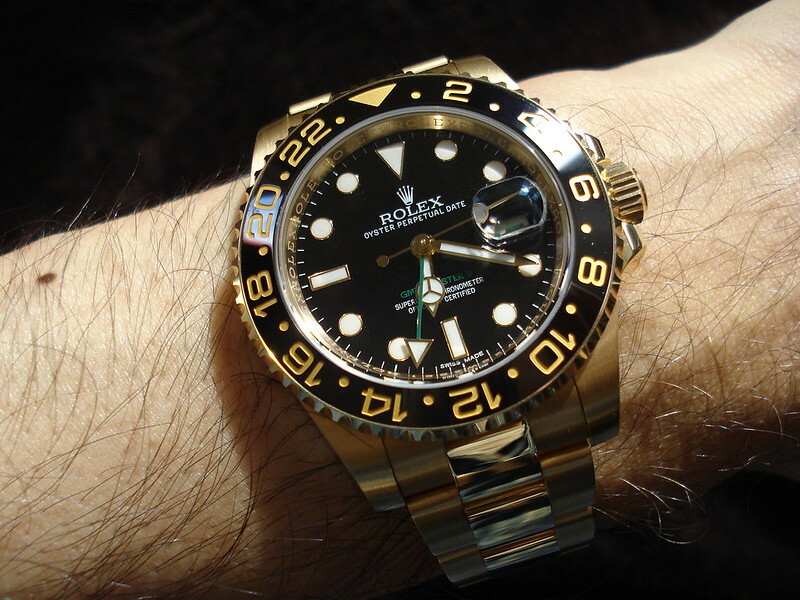 GMT is at the top of my want list right now and can't decide, need your guys help... do I go with the older 116713LN (yg/ss/black dial/green text + gmt hand) or the newer 126711CHNR "Rootbeer"? I'm genuinely torn as the 116713LN was something I'd wanted for ages- I just love that green text and gmt hand against the black dial-, but the new Rootbeer has seriously piqued my interest now- I love black and brown. At first I wasn't sure about everose (rose gold) with stainless, but it has really grown on me, plus I don't think the brown/black bezel would work with yellow gold. My dream GMT is the 116718LN, but is much past my budget for the time being... wonder what sort of discount an AD could offer on that one... Anyways, help me decide, guys! FWIW, I was told October for the new TT GMT- I'm happy to wait until then if that's the one I decide on... as of right now it's a perfect 50/50, they're both so great! My vote goes to the root beer tt. It is dead gorgeous and with the new movement it is easy decision. Just tried on a 116713LN a few weeks back and it's a very good looking watch, but the new Rootbeer is just so much better looking! I think the rose gold helps to give it more class than the yellow gold. But this is all personal. If I didn't buy the Tudor S&G I'd definitely opt for the Rootbeer myself. But given my current collection I ordered the SS Pepsi instead. Its the only Rolex TT i would ever even remotely consider. I prefer my LN but you should chose the one YOU like best. I think you’ll have an immediate answer when you see a TT on your wrist if it should be the YG or RG. Think...skin tone vs color combos! If both look great...your wallet’s toast! My vote = CHNR. CHNR is the only option in my book. Only TT I've ever considered. I would go with the Root Beer. Nice new piece. I am in the same boat and right now I’m going to buy the TT LN. I like the yellow gold color better and I can get one for a very decent price vs the unknown of the new piece in that I haven’t seen it and I wouldn’t expect any discount on a brand new reference (with a $14k price tag)... if I see it in person in the future and like it I’ll have some moves to make I guess. I'm looking forward to the CHNR over the BLRO by a long shot. It's the only TT watch I've ever considered. Potential sleeper hit for sure. another vote for the chnr. Bi-color, new movement, 1st rose gold TT GMT, no competition here. I think the CHNR now and then keep saving and get your grail in time. Half way up the 6 indices you can see the tip of the LEC. I still have not been able to see mine in the correct angles or light. I would wait until you can see them both in person and make a decision then. No rush, as the new one won't be out for awhile. I've often gone into the AD (back in the days when you could actually browse watches) with a preconceived preference, only to come out with a totally different perspective.